Rabbi Yosef is the Sephardi Chief Rabbi of Israel and is also designated as the Rishon LeZion, the universal spiritual leader to Sefardim. He is the Rosh Yeshiva (dean) of Yeshivat Hazon Ovadia, and the author of a popular set of books on Jewish law called Yalkut Yosef. 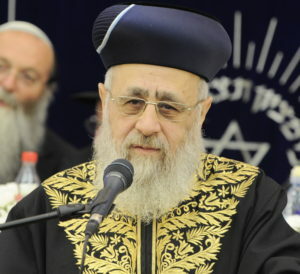 Born in 1952, he is the son of Rabbi Ovadia Yosef, former Chief Rabbi of Israel. He went to school at Talmud Torah Yavneh in the Independent Education System. At age 12, he began his studies at the junior yeshiva of Porat Yosef in Katamon, Jerusalem. After that, he studied at Yeshivat HaNegev in Netivot, and from there, at Hebron Yeshiva in Jerusalem. In 1971, when he was 18 and studying at Yeshivat HaNegev, he collected halakhic rulings from the five volumes of Yabia Omer, the book of his father's responsa, and published them in the book Yalkut Yosef. Rabbi Yosef bases his rulings on Jewish law on his father's methods of ruling. His books are considered foundational among large sectors of Sephardic Jews in Israel and the world. For these books, he has won the Rabbi Toledano Prize from the Tel Aviv Religious Council, as well as the Rav Kook Prize.